Somali women react at the scene of Saturday's blast, in Mogadishu, Somalia Sunday, Oct. 15, 2017. Maryan Abdullahi’s father had been preparing to fly to Somalia’s capital on Sunday to attend the happiest moment in his daughter’s life: her graduation day. Instead, he will bury her. On Saturday, the 22-year-old Abdullahi was making final preparations for graduation after years of medical studies when a massive truck bomb detonated in the middle of a Mogadishu street where she was travelling in a car with friends. They were killed in what has been called the single deadliest attack in Somalia’s history. At least 231 people are dead, a Somali senator said Sunday, citing doctors at hospitals he had visited, and 275 others were injured. As stories of the victims emerged, bewildered family members were still picking their way through the rubble Sunday. Ambulance sirens wailed, and overwhelmed hospitals pleaded for blood donations. 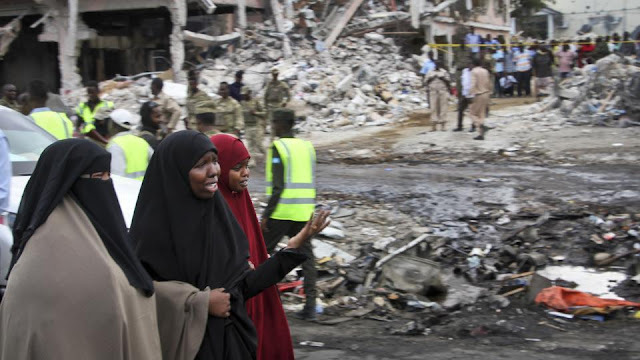 Mogadishu, a city long accustomed to deadly bombings by the Somalia-based al-Shabab Islamic extremist group, was stunned by the force of Saturday’s blast. As the huge plume of smoke began to rise, residents said the explosion was the most powerful they’d heard in years. “With a heavy heart I would say this is the worst attack I have ever witnessed,” said Masoud Mohamed, who lost family members in the blast. Parts of the busy Hodan district were flattened, with concrete buildings mangled. Cars burned. Bodies were rushed away by shaken survivors, with bloodied sandals left behind. Children carried away charred remains in cardboard boxes. Three brothers working at a nearby shopping center were among the dead, witnesses said. The explosion also killed a couple who were returning from a hospital after having their first child, said Dahir Amin Jesow, a Somali lawmaker. Dozens of weeping women stood outside hospitals, while Mogadishu’s mayor sent a desperate plea to residents to donate blood for the many wounded. Maryan Abdullahi’s father had been preparing to fly to Somalia’s capital on Sunday to attend the happiest moment in his daughter’s life: her graduation day. Instead, he will bury her.